The 6 a.m. departure began innocently enough for Dave and Katrina Miller. 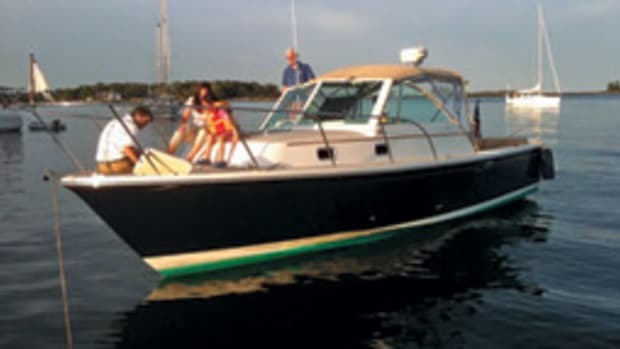 It was calm, with just a sprinkle of late-June rain, as the eager couple slipped out of the harbor in Georgetown, Maine, in the 12-year-old, 33-foot powerboat they’d just bought. Destination: Annapolis, Md., 650 miles south. The Millers — he’s a 55-year-old loan officer — had come east and bought the cruising boat of their dreams. And once they reached Annapolis they planned to truck her to their home in Renton, Wash., to begin exploring beyond Puget Sound to the Inside Passage and Alaska. Heading out into open waters on their first leg, a 95-nautical-mile run to Gloucester, Mass., conditions began to change. “The seas built to 4 feet early on,” Katrina recalls. By noon, they’d reached 7 feet, with a stiff wind on the port quarter. Still, it was a weary couple that made port that evening, limping along with a clogged fuel filter. 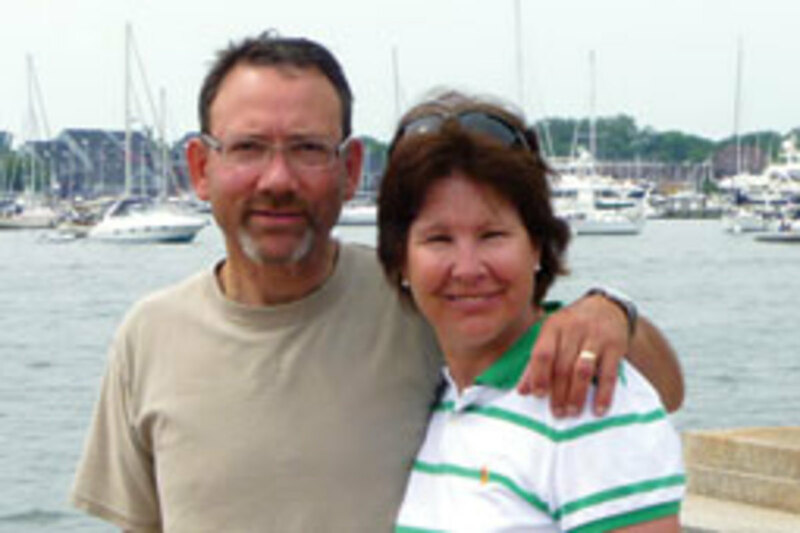 But the Millers were rewarded the next day with a perfect run, steering from the flybridge this time past Boston, through the Cape Cod Canal and along southern Massachusetts to “an absolutely beautiful anchorage” in Woods Hole, where they swam, explored in the dinghy — and napped. That was the litmus test for Kaper, the Millers’ 1999 Robinhood 33, which they bought last winter from the builder, Robinhood Marine Center in Georgetown. It’s a Cape Dory hull design, reconfigured on deck by Robinhood Marine, which acquired the well-known builder’s molds in 1998. The price was $145,000. It was in excellent condition inside, with low engine hours, although the wood trim needed “a little work,” the Millers say. The couple was impressed right away with the Robinhood’s appearance, the sturdy construction and the cabin layout. And Kaper was diesel-powered, which they wanted. 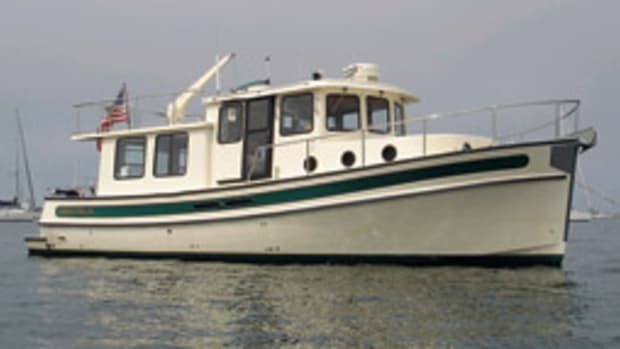 Still, why a New England boat for a Pacific Northwest couple? “Dave fell in love with the look of the Down East boats the first time we went to the East Coast in 1986,” Katrina says. The Maine-built Robinhood stands out nicely among the “white plastic boats of the Northwest,” she says. A March sea trial, dodging chunks of ice in Georgetown harbor, had given the Millers a chance to really look the boat over and get a feel for it. It has a big cockpit, wide side decks and a sliding door on the helm side of the wheelhouse. Visibility from the steering station is excellent, the Millers say. That’s a good thing in Washington, with its rainy weather. “You drive from inside a lot,” Katrina says. 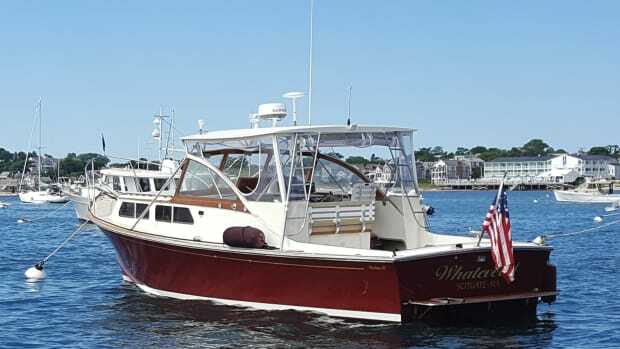 True to its New England workboat roots, the Robinhood 33 is powered by a single 370-hp Cummins diesel. Cruising speed is 15 to 17 knots. A bow thruster adds maneuverability with the single screw. Having bonded with their boat in rough weather, the Millers enjoyed Kaper’s cruising comforts the rest of the way south. They passed through Hell Gate — where the water “rushes through at rip-roaring speed,” Dave recalls — and were thrilled by the sights of New York Harbor. Then it was down the New Jersey coast, up the Delaware River and through the C&D Canal into Chesapeake Bay and a crab festival in Georgetown, Md. They arrived in Annapolis in time for Independence Day, where they easily fit family and friends aboard for the harbor fireworks. The Maine-to-Maryland voyage bodes well for future cruising. “We traveled 650 miles down the East Coast, met some interesting folks, saw some beautiful landscape and visited fun ports of call,” Katrina says. The Robinhood 33’s sturdy, upright profile shows its workboat heritage. Notable is the ample wheelhouse, with its triple-pane windshield and large side windows. 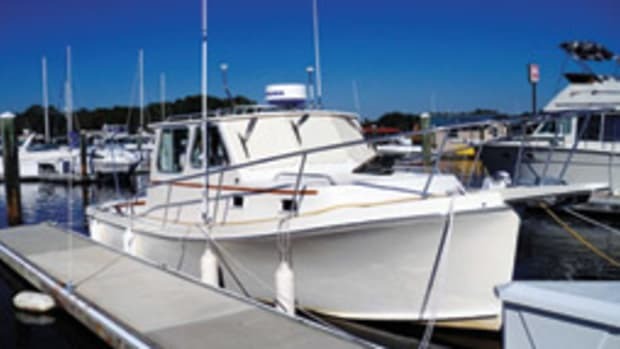 The side and bow railings, bulwarks and wide side decks are designed for safe passage around the boat. The cockpit is big enough for a day’s fishing or an evening’s entertaining, and there’s a transom door to the swim platform for convenience. The boat rides a modified-vee, hard-chine hull designed for efficient planing and for stability in beam and following seas. It’s built with blister-resistant vinylester resin, unidirectional glass and carbon fiber, and the stringers are foam-cored for light weight and strength. The helm station is to starboard, with a side door to the deck. The large instrument panel has room for an array of electronics. The cabin layout features an L-shaped settee to starboard with a high-low coffee/dining table and either a galley-down or galley-up arrangement, both with double sink, under-counter refrigerator and two-burner propane stove. The head compartment has a vanity and a separate stall shower. 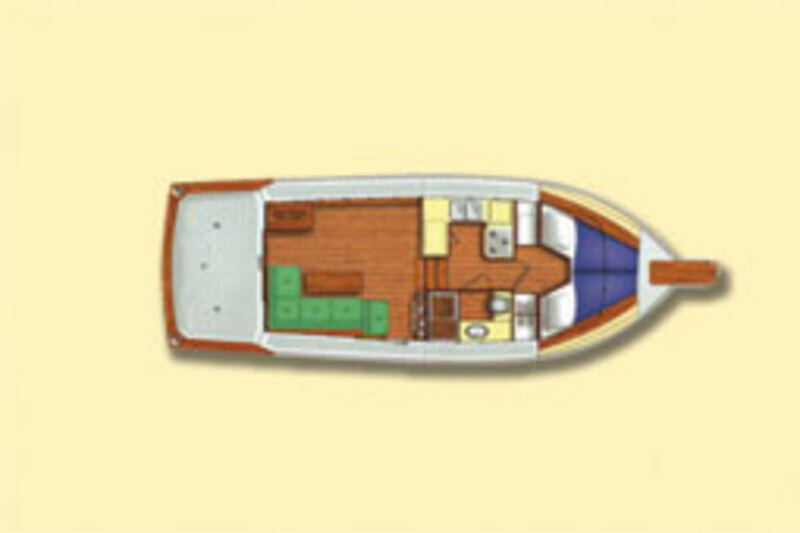 The master cabin is forward, laid out with an ample V-berth and hanging lockers. The interior is varnished wood, the cabin soles are teak and holly, and the ports are bronze. Cape Dory started in the 1960s as a sailboat builder, turning out cruising boats designed by Carl Alberg. 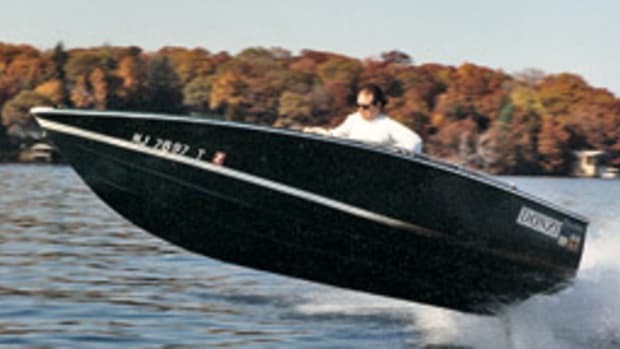 The first powerboat, a 28, came out in the mid-1980s. During the 1990s, Cape Dory produced a series of powerboats to 36 feet. 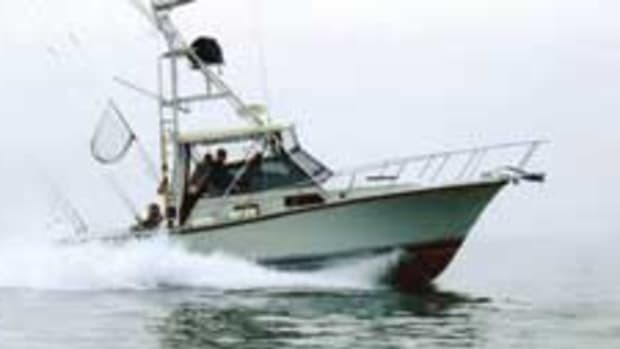 The Cape Dory 33 was in production for seven years, beginning in the late 1980s. Cape Dory boats were known for quality construction; sound, no-nonsense performance; and utility of design. 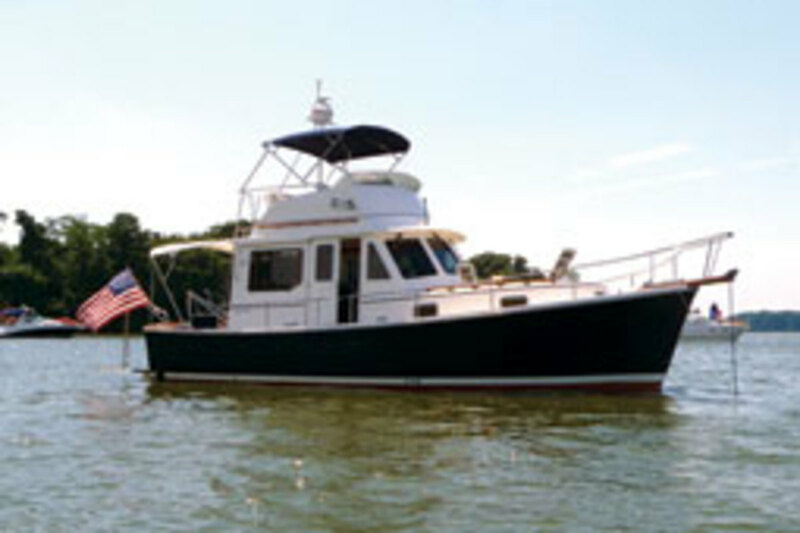 The builder’s founder, Andy Valovotis, who had purchased Robinhood Marine in 1981, sold Cape Dory in the early 1990s. It went out of business in 1998, and Robinhood picked up the molds. 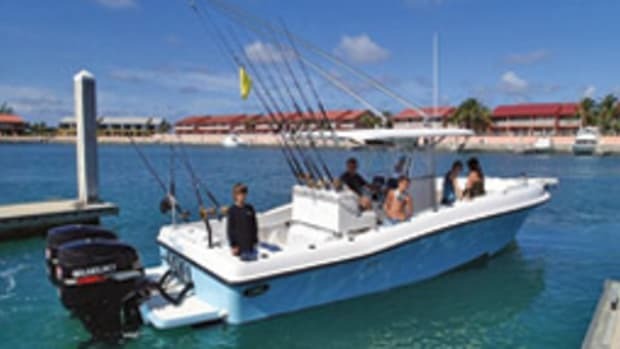 Used Cape Dory/Robinhood 33s range from around $150,000 to $295,000. Forty-eight boats. 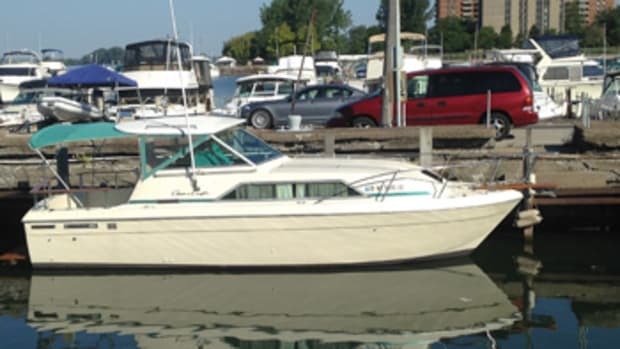 That’s the fleet 73-year-old Rick Anastos had owned during a lifetime of boating.